Gloria Barinholtz spent many years volunteering at various animal shelters. She hadn’t found a pound or shelter she could live with, and so in 1981 she founded Adopt-A-Pet, the area’s first “shelterless shelter” – a new concept based on placing animals in foster homes, rather than a shelter facility. Though many were growling that you can’t teach old dog new tricks, she was determined to make it work. For the rest of her life she pursued her passion: saving as many innocent animal lives as she possibly could. Gloria spent upwards of 8 hours a day, 6 days a week, juggling 3 phone lines, collaring new foster homes, screening adopters, showing animals, meeting with vets and giving advice to pet owners. Need a new leash on life? Lost your best friend? Gloria would answer all of these calls and make sure you weren’t barking up the wrong tree. Like a searching bloodhound, her instincts were keen. She was a master at the art of sniffing out a suitable prospective pet owner over the phone. She asked every doggone question there was. Her obedience rules could tame the fiercest and ferocious. Her devotion to educating pet owners and striving for purrfect matches eventually paved the way to Adopt-A-Pet’s success. She knew she couldn’t do it alone; she recruited an army of volunteers that had the same passion. Since then, through her dogged efforts, Adopt-A-Pet has placed an amazing over 15,000 homeless dogs and cats into new loving homes. Adopt-A-Pet will soon be celebrating their 33rd year of pulling dogs and cats out of bad situations and placing them into loving and nurturing foster homes until a permanent loving home can be found. Gloria survives in memory through the thousands of families she has helped in adopting their new-found pet. Today Adopt-A-Pet is ever stronger with the continued thankless efforts of Adopt-A-Pet volunteers guided though the leadership of the acting president, Gloria’s daughter, Randy Barinholtz. 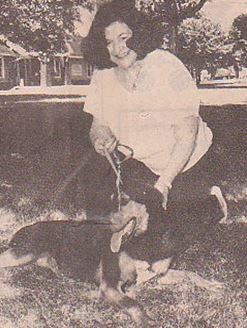 In the late ‘90’s, Gloria had the insight to approach WilmettePetCenter, who sold dogs and cats, to transition and become an Adopt-A-Pet foster home. Because of Gloria’s willingness to see compassion in all, she opened the gates for WilmettePetCenter to stop selling and become our area’s first 100% foster home ‘pet store’ for shelter dogs and cats. Please join us on November 23rd, 1:30 pm, to honor Gloria Barinholtz and the Adopt-A-Pet volunteers who have kept her vision going 33 years strong. This will be Wilmette Pet’s third anniversary of 100% adoption of dogs and cats. Help us dedicate and unveil our new adoption cat room named appropriately, Gloria’s Kitty Corner. We will also be hosting Adopt-A-Pet’s Tree of Hope Lighting Ceremony. For every donation to Adopt-A-Pet of $5 or more, an ornament of a homeless pet will be placed on the Tree of Hope. We hope to see you November 23rd and a big “Thank You” to you as your support and compassion continues to allow us all to continue saving homeless pets.